Does Deval Patrick’s America still exist? 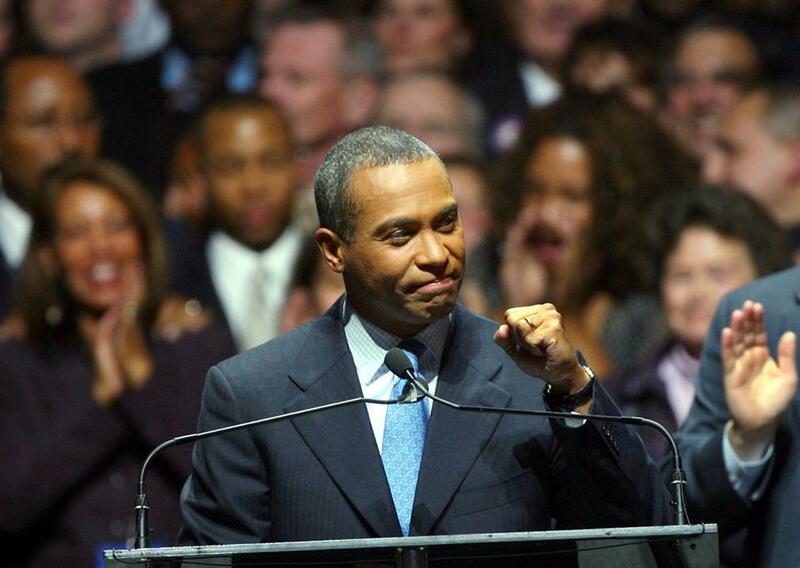 Deval Patrick celebrated after he was first elected governor. Does Deval Patrick’s America still exist? And if it does, is it big enough to make him a viable presidential candidate? To help answer those questions, the former Massachusetts governor spent the mid-term election season stumping for Democratic candidates in New Jersey, South Carolina, Texas, North Carolina, Florida, and Mississippi, testing how his relentless optimism plays these days. His most recent speeches have centered on a theme: that this country has strayed from its moral underpinnings, and that we can make our way back if more of us open our hearts, and commit to justice for everyone. “We cannot be great without being good,” Patrick says. It sounds beautiful — an arch play off the Trumpian red hats — but what does it mean, in a time of stark polarities? “When we take children from their parents to discourage them from seeking sanctuary here from violence and despair, remember, we cannot be great without being good,” he has said in two recent speeches. “When bullets fly in our houses of worship or our schools ... and our leaders choose the slogans of the gun lobby over the lives of innocents, remember, we cannot be great without being good.” On Patrick goes, his soaring rhetoric threading together unjustified police shootings of men and women of color, failing public schools, inadequate access to health care, voter suppression, and other modern maladies, urging that kindness can remedy them. This is not centrist stuff, or at least it isn’t in 2018. Patrick goes right into the red zone. This is the very antithesis of the steroidal individualism and defiant nationalism that led President Donald Trump to victory, and to which our politics are still largely captive. And the messenger is a black man. A slew of studies have shown that racial animus, not economic anxiety, was key to Trump’s victory: The Republican whipped up, and exploited, the prejudices of white voters. And if Trump is the nominee in 2020 (and he probably will be, because America) he will do it again, and even more nakedly if his opponent is black. He would belittle Patrick, with coded and direct attacks that would make the Willie Horton ad that helped sink another Massachusetts nominee look positively subtle. Other Democratic 2020 hopefuls may be planning to win white, working class Trump voters back. Patrick’s people seem to know he would have to go around most of them. If he runs, he will be relying on massive numbers of previously disengaged people turning out for him — just as he did in Massachusetts in 2006, when the long-shot won the gubernatorial nomination by working umpteen house parties across the state. “The middle is waiting for someone inspiring ... who understands their issues,” said Michael Curry, former head of the Boston NAACP who is now on that organization’s national board. “Deval has that unifying message.” Patrick declined to be interviewed. Patrick is a brilliant retail campaigner. But this is a far different — and exponentially larger — electorate from the one in which he rose to prominence. It is different, too, from the one that twice elected his friend Barack Obama president. As with everyone who seriously considers themselves presidential material, there is a healthy ego at work here, and confidence that he can overcome criticisms of his term as governor. But if Patrick decides he can win, it will mean he has decided this country is one in which many more voters will choose a challenging, nuanced message of moral obligation than will choose easy appeals to self-interest, and scapegoating. He would have to be confident that America is not yet too broken to embrace a second black president. To my eye, such optimism is willfully blind. But, oh, how I’d love to be wrong.